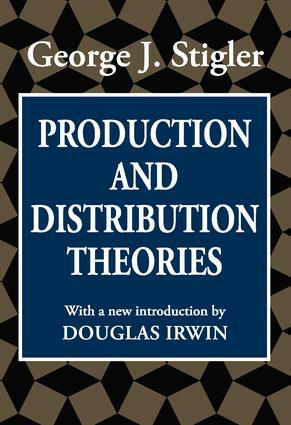 Production and Distribution Theories became a landmark in the study of economics when it was published in 1941. Nobel Laureate Stigler's book was the first to trace the development of theories alongside the history of economic thought. Stigler's pioneering effort remains a classic work on the evolution of distribution theory during a critical juncture in the development of modern industrial capitalism.Stigler examines the writings of major economists during the century, including William Stanley Jevons, Phillip Wicksteed, Alfred Marshall, F.Y. Edgeworth, and Leon Walras. He uses their works in order to show a variety of perspectives on distribution theory. Among the methods of thought he explores are neoclassical price theory and marginal productivity theory.In the new introduction, Douglas Irwin illustrates how this book came into being and notes its continuing significance to the study of economics. Joseph Schumpeter commented in his History of Economic Analysis that this excellent work by a competent theorist is perhaps the best survey in existence of the theoretical work of that period's leaders and is strongly recommended. This judgment still stands. The book will be of great interest to those interested not only in neoclassical economics, but also in the sources of Stigler's economic thought.